Endura-Form Plastic Solutions Ltd., a manufacturer of innovative plastic heated floor panels with a wide range of industrial applications, has approached the College of New Caledonia (CNC) to research the use of the Endura heated panel in two greenhouse applications: (i) heated mini domes inside the greenhouse for assessing energy consumption during cold season and (ii) to boost seed germination in outside heated beds. 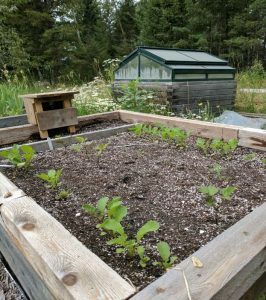 The heated panel was placed at the bottom of an insulated raised bed with a total footprint area of approximately 15 square feet. The mini dome canopy was initially made of a double-layer cloth and then replaced by a plastic bubble wrap (Figure 1), for an insulation gain of 78%. The heating element average consumption was 143Wh and that led to a temperature gain of 9.5 C; in other words, the energy requirement for that particular mini dome design was 1 Wh per square foot for 1 ᵒC temperature gain. The second experiment was carried out outside in two growing beds with no canopy. One Endura panel was placed at the bottom of the treatment bed and heated by three heating rods for a total capacity of 450W. 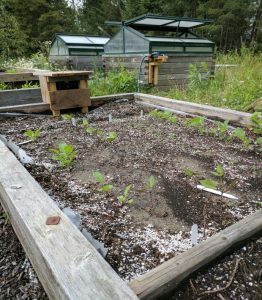 Seeds of four vegetable species were planted: radishes, bean, dill and kale. The germination in the heated bed started approximately six days after seeding with beans and kale germinating first (Figure 2), while the beans and kale in the control bed emerged two days later. Figure 2. Germination and growth after 9 days – bed with heated panel at left and control at right. 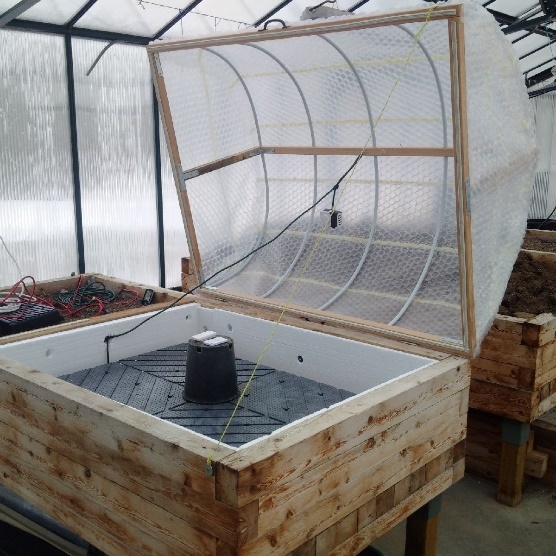 The stable temperature conditions of the soil in the heated bed allowed the germination to take place without interruptions and was certainly responsible for the faster growth rate (Figure 3). Figure 3. Growth after 17 days – bed with heated panel at left and control at right.